in July 2012 the Sensation World Tour will take place in the Amsterdam Holland Arena, a massive Olympic stadium. Sensation White is the largest dance event to be held in this stadium. This is the most popular and the biggest dance music global phenomena by ID-T. See the Sensation Video. 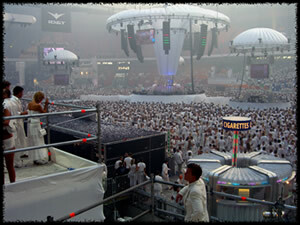 Sensation Amsterdam Holland 2012- The Worlds Leading Dance Event! 10.00 am CET the Sensation call center with everyone dressed in white, began the presale for Sensation. Right out of the gate the call center was under dance music attack; the phone lines rang & rang non-stop until all tickets for the dance music event for July 5th in the Amsterdam Arena were completely sold out. Just like every previous year Sensation was sold out in no time at all. Sensation 2012 Tickets Amsterdam Can be purchased here for much less then other websites. Sensation is held annually. 2012 Sensation is a major trance dance event. Located in the Amsterdam Arena Sensation 2012 (usually scheduled every first Saturday of July since the year 2000) will see almost 55,000 trance fans and trance party flockers from around the globe. This is a must see dance music event put on by the folks at IDT. Meet trance fans from all over the world in one place. TranceElements.Com can say first hand that everyone at these events are normally very friendly and it will be a time you wont ever forget. So if you are going to Sensation 2012 contact us and let us know. ID&T in Amsterdam, the company that organizes the event, claims that Sensation is the "World's leading dance event", with more than 55,000 people attending a single show, this is a huge trance party. During 2000 and 2001 this event was labeled 'Sensation', focusing on trance music & house music. There are numerous ID&T events all with their own focus. Trance is often viewed as 'softer' comparing the other two 'harder' genres, thus ID&T events give EDM fans a choice. Visit ID&T's website for more info on the various shows globally. Sensation 2012 will be held in Chile, Czech Republic, Russia, Portugal, Denmark, Brasil, Belgium, Germany & Poland. Every year, ID&T sells a yearly album and singles containing that year's anthem for each edition of this music event. Special thanks go out to ID-T one of the most dedicated organizations in the trance music event industry. Irfan van Ewijk who's spent much time with us at TranceElements.com. Thank you Irfan & ID-T for the ID-T special treatment during Sensation Holland, Sensation Black & Sensation 2012. A music event site worth waiting for is here: TranceElements. TranceElements.Com is a Free Trance Radio station. Listen in regularly & look for updated sensation white postings, concert ticket sales, music downloads, music event posts and trance music links from all over the globe.